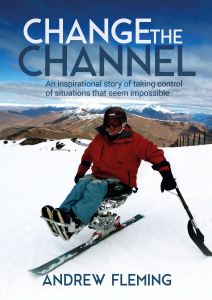 An inspirational story of taking control of situations that seem impossible. Andrew says, “I used to look at people in wheelchairs and think about how hard it must be for them not being able to walk. Realistically, I had no idea of their struggles. For me, the biggest challenges are things I least expected.” Like chronic pain 24/7, the emotional turmoil of a marriage breakdown soon after his accident, and the harsh financial realities of being uninsured and unable to return to any full-time work. Andrew’s book is an honest and open account of the huge challenges - and the smaller ones - he has had to face in coming to terms with his disability without letting it defeat him. The frustration of being unable to change the channel on his hospital TV immediately after his accident became the metaphor for his life: He realised he could at least change the channel on his thoughts, from negative to positive, and in doing so, be open to finding the solutions He needed to achieve what he wanted. His book asks some big questions as well as offering some practical and pragmatic advise on why we should all be better prepared for such a possibility. What would you do if something similar happened to you? Andrew’s story provides valuable insight into how to: plan your future financial security find hope in your darkest moments rise above seemingly impossible challenges. There is always a choice - it’s up to you to see it! Click here to get a FREE chapter of Change the Channel.